This is the little female- the only female. Their eyes opened yesterday afternoon. Bee (daughter of Nolan's Last Bullet) is the best mom I've ever seen. I couldn't ask for better. Jim Berkowitz, her owner, is rightly proud of her and her skills. For a first litter, she is great! Only one male is not spoken for. Not sure which actual puppy that will be at this point. They are all great looking liver and white pups. Fat and very happy! 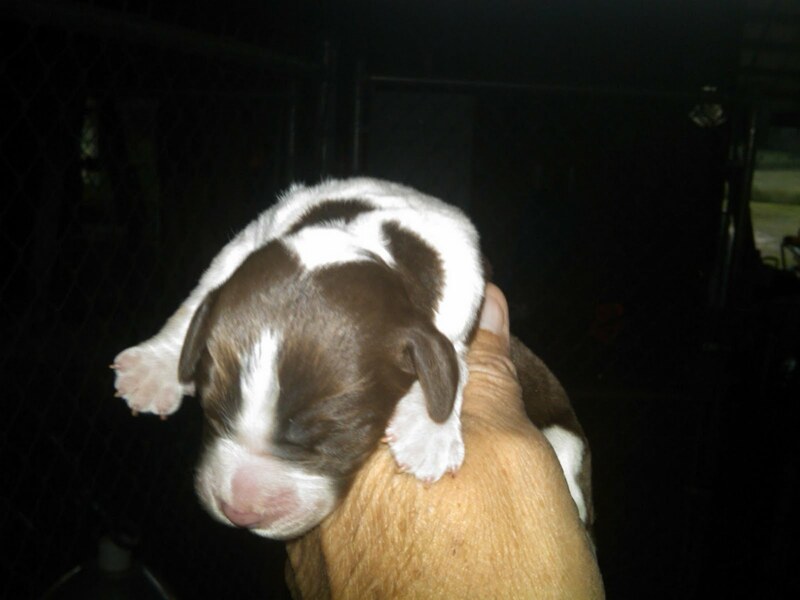 Ace (grandson of Nolan's Last bullet), the daddy did good in this litter. I will keep one male and one other one is spoken for. The remaining male is available. I'm not trying too hard right now, since I'll keep him, too, if no one steps forward. I would love to keep all of them. They'll have a life of hunting around the country- what's not to like about that! 770-584-5085. An Elitist Sport- maybe not!